Chameleon Services, LLC, the newest division of Haynes Group, Inc., has been engaged by AIC Ventures of Chicago, to liquidate the contents and repurpose the use of 35 United Dr., a 618,000 s/f warehouse/distribution building. 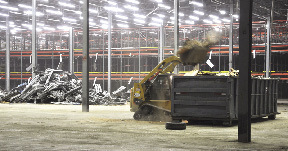 Chameleon is demolishing over 1,000 tons of steel mezzanines and dismantling 130,000 s/f of automated racking systems that were used by the former tenant, the Woman's Apparel Group, which used the space for internet sales and retail distributions. The property was designed with many capabilities including: Clear heights up to 65' with 50' x 50' column spacing, in place narrow isle racking (fully fire suppressed), 131,000 s/f of office, 109 acres allowing for expansion, over 1,000 parking spaces and 300 trailer spaces, 42 tailboard loading doors with seals and levelers, two drive-in doors (12' x 14' ) and 37 restraint locks. Chameleon is also donating truckloads of clothing, furniture and office supplies to local children and veterans groups. The former tenant abandoned the clothing and furniture. "Haynes Group was the logical choice for this job because of their project management experience over the last ten years, their Chameleon Division capabilities and the fact that they are a local company with a great reputation and the same levels of creativity and integrity that has made our company successful," said Brian loft director of asset management in AIC's Chicago Office. Haynes Grp. principal Mike Haynes was excited about the opportunity to participate in reactivating a local commercial property that has employed 3,800 people. "It has been a pleasure to partner with AIC Ventures, highlight the unique services that our Chameleon division can deliver, donate truckloads of clothing and furniture to children's and veterans groups and help ready this prominent building for new tenants and new employment in the area," he said. Chameleon Services provides site work, demolition, painting and service contracts. Haynes Grp. is a family-owned, full service commercial and residential construction company based in North Easton. The Haynes Grp. has five divisions that address the full range of needs for our clients and our business. They include: Haynes Commercial & Tenant Improvements, HG Management, Haynes Custom Homes, Haynes Capital and Chameleon.